The Water Alliance is a unique partnership of public and private companies, government agencies and knowledge institutes involved in water technology in the Netherlands. The Water Alliance focuses on innovative and sustainable water technology that can be used worldwide. It brings together a complete chain of innovation for water technology, from first idea, research & development, specialised laboratories, a water application centre, various demosites, launching customers to international applications with commercial companies. Indeed from knowledge to business. It is driven by the idea that technological development and innovation is needed to develop new markets and thus create new business opportunities for the water technology industry. 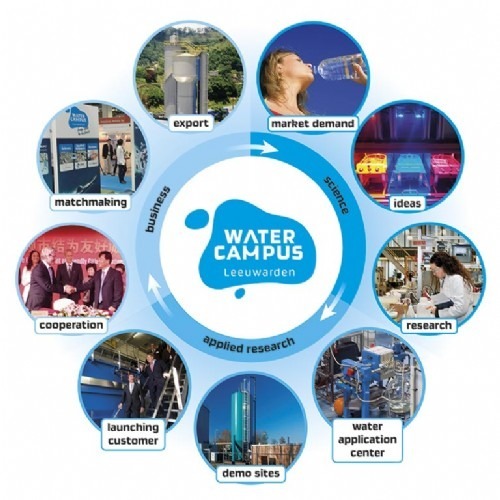 In this way the Netherlands will become the European Water Technology Hub, with its focal point at the WaterCampus Leeuwarden.